Fortunately, if you're in trouble (and the situation is suitably intriguing), Sherlock Holmes might give you a discount, especially if there is a hint that Professor Moriarty is involved. More mundane matters can be referred to the bobbies of Scotland Yard—and no, being maimed by machinery in the workplace doesn't count. Job prospects are a bit thin since the Industrial Revolution, and chimney-sweeping, workhouses, and factories aren't so bad (even when run by bitter old misers). Would you rather be in the poorhouse? Be wary also of wispy men with capes and strangely pointy teeth, spiritualist cultists, escaped convicts, mad or mercurial scientists, boarding schools, wide-eyed waifs, and suspect meat pies. Also, that strange man you saw might just be your secret uncle's best friend's sister's former roommate's dog. All of which is overseen by Queen Victoria, who seems to have some connection to every sinister conspiracy threading its way through London streets, assuming she's not in their cross hairs. This is a trope that is disturbingly accurate at times. The Victorian Era also happened in the rest of the country, of course, but, as we all know, Britain Is Only London. It's also the de facto setting for Steampunk stories or a Gaslamp Fantasy. The anime and manga Black Butler is set primarily in the Victorian Era, with a dash of Anachronism Stew for taste. Count Cain, possibly the Victorian-esque manga. The Empire of Corpses takes place in alternate Victorian era where the Industrial Revolution is powered by reanimated cadavers called "Frankensteins". The anime Victorian Romance Emma and Emma, the Manga it was based on. Phantom Blood, the first part of JoJo's Bizarre Adventure, is set in the Victorian Era. Both The Princess Thieves and its prequel The Christmas Thieves take place in an Alternate History Victorian London. From Hell, based on Jack the Ripper. French comics Basil and Victoria (and the cartoon adaptation, renamed Orson and Olivia) follows two orphans making a living by rat-catching on the streets of Victorian London. French comics Professor Bell, by Joann Sfar. Predator Nemesis. Ex-British Army Captain Soames is enlisted by Mycroft Holmes and the Diogenes Club to investigate a grisly massacre in an opium den, the killer being identified as "Rakshasa" by the sole survivor. The killer is the same Predator Soames encountered in India years before. Sherlock Holmes is mentioned (Soames is enlisted mainly because Sherlock is "out of the country at the moment", and it's implied that Mycroft is aware of Soames' previous encounter) as well as Jack the Ripper, whom is initially thought to be the culprit by Soames, and is strongly implied by Mycroft to have been killed by the Diogenes Club, but the details of his identity and his exact fate are kept secret from the public. Ruse: The city of Partington is almost exactly like Victorian London, except that it's on an alien planet because it's part of the Sigilverse. In the Marvel Comics version, Parlington is simply Victorian London with a No Communities Were Harmed name. Doctor Jekyll and Sister Hyde moves the action to London from the original Scottish setting, among other changes. Gaslight is set in London of 1875. The movie won the Academy Awards for Best Art Direction that year. Instead of the original novel's Paris, The Phantom of the Opera (1962) is set in London during the late Victorian era. Many Sherlock Holmes adaptations, although almost as many modernize him—Holmes films made in the 1920s were often set in the then-present day. The Basil Rathbone films started out in Victorian London, then switched to a contemporary setting after a Studio Hop. Topsy-Turvy, a movie about Gilbert and Sullivan and the staging of their operatta The Mikado. The setting for part of the second and third act of The Wolfman (2010). Dracula: The Bram Stoker novel and many of its adaptations. Ankh-Morpork on Discworld, except it's more like modern New York set in Victorian London. With dwarfs. And trolls. There's even a few neurotic vampires with hilarious accents. Many of the works of Charles Dickens, such as famously A Christmas Carol, David Copperfield, Bleak House, and Oliver Twist, to the extent that such settings are often described as "Dickensian." Not all of them, technically speaking, though. Little Dorrit takes place in 1826 and The Pickwick Papers in 1827-8, in the Georgian Era. Those were published in the Victorian years, though, and at least once Dickens made an anachronistic reference to "Her Majesty" or some other development that had taken place between the time they were set and the time he was writing. The Time Machine and most of its adaptations feature this as the Time Traveler's own era. The War of the Worlds centers around the exodus of London at one point. And it's where the Martians die. In 1898. The Witch Watch is set here for the most part. Elizabeth Peters's Amelia Peabody stories start in this period and move through The Gay '90s into World War I. But Amelia and her husband (though notably not her children) retain their Victorian London sensibilities throughout. Most of their adventures actually happen in Egypt, as they are archaeologists. Anne Perry's mystery novels are very conscious attempts to subvert the common Victorian stereotypes, by playing up the tension between facade and the reality of human emotion. When this works, it works brilliantly; however, when it doesn't, the result tends to be lurid melodrama that makes LeFanu look plausible. The second trilogy of the Welkin Weasels depicts a furry version of Sherlock Holmes—not connected in any way to The Great Mouse Detective or Sherlock Hound, but a weasel by the name of Montegu Sylver living in a Victorian London Fantasy Counterpart Culture full of furries. Philip Pullman's Sally Lockhart series. Molly Hughes's A London Family trilogy does for middle-class London what Flora Thompson's Lark Rise To Candleford did for rural England at largely the same time (1870s-90s). Thompson and Hughes even wrote their books at the same time (1930s). The Arcane Society novels written by Amanda Quick fall into this era, whereas the novels that the same author wrote under the name Jayne Ann Krentz are modern era, and Jayne Castle are futuristic. Sarah Waters's Fingersmith, published in 2002 and made into a BBC drama in 2005, is a gay and lesbian take on the setting, with dips into the mental health tropes of the era, including a stereotypical Bedlam House plot and a man after an inheritance. One of the downtime locations of Time Scout. The two latter books take place during Jack the Ripper's tour de force. The Gemma Doyle series takes place here. The Infernal Devices, prequel trilogy to the Mortal Instruments series, takes place here. Michel Faber's The Crimson Petal and the White, also adapted for television by the BBC in 2011. Some of the mirror gates in The Stoneheart Trilogy lead to this era. Arguably the most important one leads to the Frost Fair, 1888, where it turns out that it's true that "you can't change the past, even if it hasn't happened yet". Dodger and the non-fiction spin-off Dodger's Guide to London. Diogenes Club stories starring Charles Beauregard, before he became the Old Man to Edwin Winthrop. Mr Warrens Profession takes place half in Victorian London and half in Victorian Manchester. A not uncommon destination for Doctor Who: "The Evil of the Daleks", "The Talons of Weng-Chiang", "Ghost Light", "The Unquiet Dead", "Tooth and Claw", "The Next Doctor", and "Deep Breath" have all been set in the Victorian era. 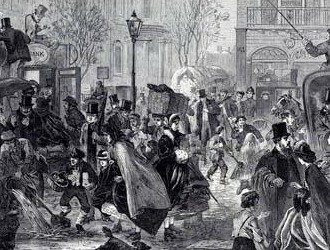 "A Good Man Goes to War" has a short scene in Victorian London and two characters from the era are prominently featured. Even knockoffs of Victorian London have been seen: "The Ultimate Foe" was set in a simulation of Victorian London (long story), and "A Christmas Carol" was set in Victorian London IN SPACE! Then the Mark Gatiss-penned episode "The Crimson Horror" took us to Victorian Yorkshire. The Bleak Old Shop Of Stuff, being a Sound to Screen Adaptation of Bleak Expectations. Dickensian, a drama series that brings together iconic characters created by Charles Dickens in one neighbourhood. The 1900 House is a short series where a modern (1999) English family roleplay living as a middle class family in late Victorian London. It was the first on a series dealing with different time periods. Penny Dreadful a Gothic Horror story which uses 1880's London as its default setting. Though later seasons branch out a bit. Given that it concerns Jack the Ripper, The Outer Limits (1995) episode "Ripper" takes place in London in 1888. The cello rock band Rasputina uses imagery from this period in their songs, and their website even claims that the band was created in 1891. Radio comedy series Bleak Expectations parodies this trope up one side of the workhouse and down the other. Audio fantasy-adventure series The Springheel Saga, based on the Victorian urban legend of Spring-Heeled Jack. One of the domains of Ravenloft, the city of Paridon, aptly enough for a Gothic setting, is Victorian London, including a Jack the Ripper Expy. The Masque of the Red Death alternate setting is entirely set in the Victorian Era, and centers on London. One of Ravenloft's domains, Odiare, was taken from Gothic Earth. In Kerberos Club this Victorian society of (super)heroes has its headquarters in London throughout the age. Towards the end of the 1800s it's them that saves the city from an Atlantean attack and a robot uprising. The appropriately-titled Victoriana RPG, from Cubicle 7 Games, uses this setting (with a few fantasy modifications) as a jumping-off point. Victorian Age: Vampire covers the era from 1880 to 1897. London in this era is the standard against which the Kindred measure all other cities—and also a deeply dangerous domain where only the savviest survive its politics. Victorian Lost, a historical setting for Changeling: The Lost, focuses on Victorian England in the 1890s. The tourist attraction The London Dungeons in London has some areas themed this way. San Francisco's Great Dickens Christmas Fair. City of Haze and 13th street in Castlevania: Portrait of Ruin. The moments of Alice: Madness Returns not set in Wonderland are set in Victorian London, aka The Real World for Alice. Wizard 101: The world of Marleybone is an Expy of this mixed with Steam Punk. Oh, yeah, and the people are all dogs, cats, rats, or the occasional frog. The city from The Misadventures of P.B. Winterbottom is most likely Victorian London, given the visuals of the place, but nothing is ever stated. The setting for Amnesia: A Machine for Pigs, sequel to Amnesia: The Dark Descent. Browser game Fallen London is set in Victorian London after the city was stolen by bats and buried a mile underground. Victorian tropes abound, as do cameos from Public Domain Characters. Assassin's Creed: Syndicate and its companion novel ''Assassin's Creed: Underworld both take place here. Fable III features a fantasy equivalent, along with a corresponding Victorian Britain. The city of Bowerstone is right in the middle of an industrial revolution and with your influence you can turn into a Wretched Hive or, with a great deal of effort and Guide Dang It!, into a thriving metropolis. The setting for one of the waxworks in Wax Works, where your twin brother is none other than Jack the Ripper. minus. : This strip through time travel. The main setting for Mayonaka Densha, though also through time travel. "Treehouse of Horror XV": The "Four Beheadings and a Funeral" story in this The Simpsons episode is this trope applied to the show. Most of The Pirates! In an Adventure with Scientists!